ABOARD THE PAPAL FLIGHT FROM MANILA, Philippines (CNS) — Pope Francis said his September trip to the U.S. will take him to Philadelphia, New York and Washington — where he intends to canonize Blessed Junipero Serra — but probably no other stops. Pope Francis made his remarks Jan. 19, in an hourlong news conference with reporters accompanying him back to Rome from a weeklong trip to Asia. Four days after announcing he would canonize Blessed Junipero in the U.S. in September, the pope said he wished he could do so in California, the 18th-century Franciscan’s mission field, but would not have time to travel there. The pope said he planned instead to perform the canonization ceremony at the Basilica of the National Shrine of the Immaculate Conception, saying Washington would be a fitting location because a statue of Blessed Junipero stands in the U.S. Capitol. 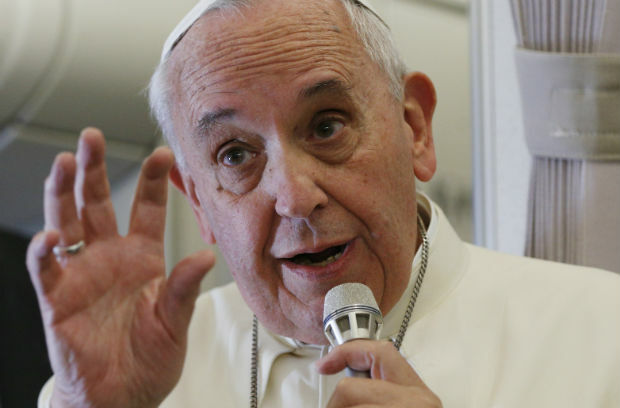 The pope also confirmed he would visit the United Nations in New York. He had already announced his participation in the late-September World Meeting of Families in Philadelphia. Asked about widespread speculation that he would visit the U.S.-Mexico border on the same trip, Pope Francis said “entering the United States by crossing the border from Mexico would be a beautiful thing, as a sign of brotherhood and of help to the immigrants.” But he said making such a visit would raise expectations that he would visit Mexico’s shrine of Our Lady of Guadalupe, and he joked that “war could break out” if he failed to do so. “There will be time to go to Mexico later on,” he said. Catholic News Agency reported on a proposed schedule that U.S. and U.N. church leaders have submitted to the Vatican. That schedule, which has not yet been approved, would have the pope arriving in Washington the evening of Sept. 22; visiting the White House and celebrating Mass at the shrine Sept. 23; addressing a joint sessions of Congress Sept. 24 before traveling to New York City to address U.N. General Assembly Sept. 25. As previously announced, he would spend Sept. 26 and 27 in Philadelphia for the World Meeting of Families. However, sources familiar with the trip planning have noted that plans submitted to the Vatican are not always approved, and Pope Francis’ comments about the canonization of Blessed Junipero indicated not all plans are finalized. His Jan. 15 announcement on the plane from Sri Lanka to the Philippines surprised even the people who have been promoting the sainthood cause of Blessed Junipero. The CNA interview with Archbishop Bernardito Auza, Vatican nuncio to the United Nations, said the Mass at the shrine “would be primarily for bishops, consecrated and religious men and women, seminarians and representatives from humanitarian and Catholic charitable organizations,” while Pope Francis said that is when he would canonize Blessed Junipero. Pope Francis would be the first pope to address a joint session of Congress. She said media credentialing would open after the Vatican releases the schedule and would be coordinated through the USCCB Communications Department. In 2008, almost 6,000 media applications were processed for Pope Benedict XVI’s visit. During his pontificate, St. John Paul II visited the United States seven times — two of which were fuel stopovers — making the country his most frequent foreign destination after his native Poland. He addressed the United Nations in 1979 and 1995; Blessed Paul VI did so in 1965, and Pope Benedict addressed the assembly in 2008, during his one visit as pope. Pope Francis said he hoped to visit three Latin American countries in 2015 — Bolivia, Ecuador and Paraguay — and three more — Argentina, Chile and Uruguay — the following year. He said he planned to visit two African countries — the Central African Republic and Uganda — in late 2015. He emphasized that all of those trips were still in the “hypothetical” planning stages.